It's me, Jane from Buzzmills, back again with another "Kids Create" project to share with you. And, as you might have guessed...it is, indeed, inspired by an upcoming "holiday" of sorts, Earth Day! Just recently we updated the kid's craft space. As they grow and get older their creative space tends to need a little revamping every once in a while. This latest update, however, was more about my need to have a decluttered space for them after the fresh coat of paint our basement received a few weeks ago. In their new craft space everything is easily accessible to them and everything has it's own place! Everything but...all of the tiny little bits and pieces of scrap and trash papers that are consistently floating around. And, typically, in my flurry (and sometimes fury!) of cleaning those bits up I tend to absentmindedly toss them into the trash. Not a very Earth Friendly thing to do. The kids, in fact, have been asking for their own recycle bin for paper in their craft space for quite some time now, goodness knows they need it! So, since everything else in their new space has it's own place and with Earth Day approaching next week (Aprill 22!) it seemed like the perfect time to come up with a solution! All you need are a few supplies: glue, a bamboo skewer, and a stapler...and raid your recycle bin. At the corner point of one sheet of newspaper, tightly roll your paper around the bamboo skewer. Move diagonally across the paper, carefully sliding the skewer out as you go so that it doesn't get "trapped" inside the newspaper straw. When the sheet is nearly all the way rolled up and you have only a small(ish) triangle left apply some glue along the paper edges and finish rolling. Continue to make several (many, many, many) more paper straws. It takes a lot! This part is probably the most time consuming of the entire project. It does take some patience and practice initially, but soon enough you've got the hang of it! Violet really enjoyed this part and it's process once she got the hang of it. After you've finished your newspaper straws, it's time to raid the recycle bin once more. Grab a piece of cardboard (or two) and cut out the bottom of your basket. You will need two pieces cut the same shape and size. I opted for a circle about 10" in diameter. You can really make whatever size or shape you want, I will say though that I found a rectangular shape to be a bit more challenging. Corners can be tricky, which is why we went with round instead. After you've cut out two cardboard pieces for the bottom of your basket, staple your newspaper straws evenly around the perimeter of one piece. I started stapling four of mine equidistant from each other and then filled in the spaces in between from there. Place your second piece of cardboard on top, sandwiching the paper between your two bottom pieces. Staple bottoms together all the way around. Now it's time to start weaving! You might want to staple the two together as well to ensure that they don't slide apart. Also, as your are weaving, occasionally staple horizontal paper pieces to vertical paper pieces to hold them in place as you go. I should warn you...while fun and soothing, this process can get a bit unwieldy at times, especially if you are making a larger basket as we were. Not really a problem though, just a two person job at times, which, actually makes it even more enjoyable! The weaving process doesn't take as long as the paper rolling process, but it can take a bit of time. In fact, while we did this project in one afternoon, you might want to consider making it a two sitting project. That being said, Violet and I really enjoyed this part! Working together, hand in hand. Chatting and singing and watching as a basket slowly began to form in front of us! Before you know you've got a nearly complete basket in front of you! To finish, simply fold over the excess from the vertical newspaper pieces and weave them down and back into the basket. For handles, instead of weaving excess ends into the basket, turn them to the side to create an arch and staple in place to the top horizontal edge. Now, you've got a place to toss all of your unwanted and ready to recycle paper scraps! Make a writing mistake? No problem! Now, we've got a spot for everything, including a spot for our paper scraps! 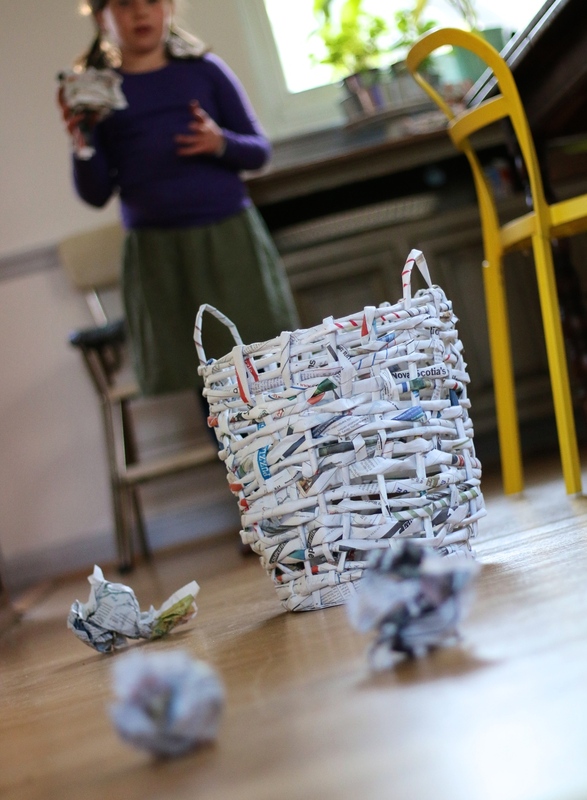 A perfectly, imperfect basket made from recycled materials for our to recycle materials! I'm not sure we imagined it turning out so well, but I have to be honest...we are pretty thrilled with the results! Happy Earth Day and happy recycling!